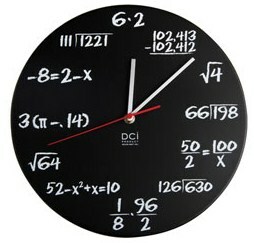 The Math Wiz Clock is a perfect gift for all the math and numbers geeks out there. This academically challenging clock shows all the numbers in the form of math equations on a chalkboard. This is one fun and entertaining timepiece. Just don’t strain your brain too much trying to tell the time. Click here to see larger image.